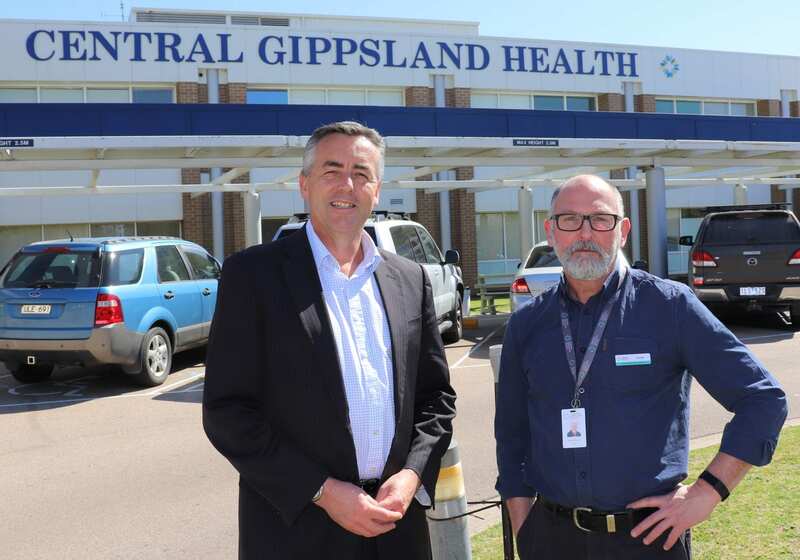 The Federal Member for Gippsland Darren Chester is pictured outside Sale hospital with Central Gippsland Health Chief Executive Officer Dr Frank Evans. Funding for hospitals in Gippsland has increased by up to 50 percent since the Federal Government took office in 2013. The Nationals Member for Gippsland Darren Chester said Commonwealth activity-based funding for the Latrobe Regional Hospital, Central Gippsland Health and Bairnsdale Regional Health Service had jumped by a combined total of $34.3 million over the past five years. “This funding is allocated on the basis of the number of patients and the complexity of the treatment provided,” Mr Chester said. “So this increase can be seen as a reflection of the growing number of patients and the type of medical help being provided. “A strong health service is vital for people living in Gippsland. It needs to be well-resourced and provide the care people need, when they need it. “The health sector is a major employer in our region. A well-funded health service is attractive to health professionals seeking a fulfilling career in a regional area. The Prime Minister and the Minister for Health recently announced a $1.25 billion boost to health services for patients right around Australia to provide more doctors, nurses and services. Mr Chester said Australia’s strong economy had enabled the government to make a further investment in the nation’s good health. “The $1.25 billion Community Health and Hospitals Program will fund projects and services in every state and territory to support patient care, while reducing pressure on community and hospital services,” Mr Chester said. The new program will complement the Federal Government’s record investment in public hospitals, which includes the increased funding for Latrobe Regional Hospital, Central Gippsland Health and Bairnsdale Regional Health Service. • $300,000 to help build a new medical centre in Mallacoota. Mr Chester also successfully lobbied his Federal Government colleagues to have Central Gippsland Health named as one of 10 locations across Australia to receive Medicare subsidised MRIs from November 1, 2018.